Jesus can be your friend and Savior. All Christian parents want their children to come to a relationship with Jesus. My Friend Jesus is written in fresh, clear language that children can understand and is appropriate for all denominations. 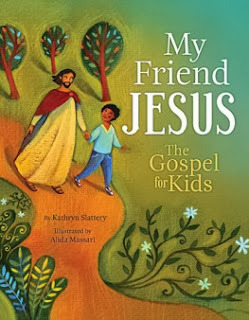 The book not only tells the gospel story about Jesus, but also, in the most natural, gentle way, introduces children to a personal relationship with Him. A prayer at the end of the book guides children into that life-changing friendship with Jesus. This is the book author Kathryn Slattery wishes she had when her own children were young—which is the reason she wrote it! This is a beautifully illustrated hardback book that will be a treasured addition to your home library. I can envision reading this book to children as they come through our home, sharing the Gospel of Jesus with them. This would make an excellent book for a gift to a Sunday School teacher, or even to include in your church's library. This book clearly gives the message of the salvation through Jesus in a easy to understand manner. Enter to win a copy for yourself or donate to a Children's Ministry! Caring and being trustworthy are important. You want to be able to rely on them in good and bad and have fun with them. I think loyalty,honesty, and respect are important qualities in a friend. Honest is the most important!